There are few people throughout Europe who can boast of cooperation with one of the largest scientific organizations on the planet, such as “National Geographic”. The young scientist from Bugojno Andrej Gajić (28), who is currently in charge of the “Shark Tales” department at “National Geographic” and the general manager of Marine and Freshwater Biology Sharklab ADRIA, which owns the sectors on as many as three continents, Asia, Africa and Europe. In a conversation for SeeSrpska, Gajić talks about his success, work, science, but also encounters with sharks and other animals from the underwater world. “Love for this profession dates back to early childhood. Although I moved more than fifteen times, this did not prevent my desire to devote myself to explore the depths of the sea, nor did I find that the current situation and life address could slow me down. The sea and oceans cover the largest part of our planet, and they are inevitable part of every individual was they aware of it or not. I remember my first encounter with the sea world from very early age, when in the shallow coastal waters I raised the pebbles and watched all the organisms who found their home there. The complexity of marine ecosystems, and in general all the water bodies, which, as if not from this planet, left a special impression on me and surely was one of the “culprits” that I had just devoted to this discipline. Today, most of my studies are focused on pathology, which is my primary scientific discipline, but I still enjoy the field, diving and working with animals, “says Andrej. He was born in Bugojno, grew up in Gradiška and Tuzla and graduated Biology in Sarajevo, dreaming of being a scientist and dealing with what he is doing today. Gajic told SeeSrpska that the road to engagement in “National Geographic” was hard. “Far more than most people can imagine. First of all, the will and the faith, then the effort and the work. To the position of the manager of “Shark Tales” in “NatGeo” I needed 10 years of professional engagement, more than 50 published scientific articles, two books, and many field experience. Of course, what matters to NatGeo itself is that you have innovative ideas that will be highlighted in tens of thousands of applicants in the competition. It will be equally supported by an affiliated scientist, as well as a newly born student with strong and concrete ideas,” explains Andrej. It tells us that the dive into the unknown, especially at night, provides a slightly different underwater experience, but the beauty and luxury of the same carry with it a lot of danger. “The team that I lead for the most often shallow night dives, each of us individually descends 30 to 40 meters deep where he spends most often 60 minutes in working with animals, shooting, taking samples and so on. I have run more than 30 expeditions along Europe, Asia and Africa. My favorite dives are in Neum, Turkey and Malta. Night solo dives on mud sediments are dangerous and require a very large dose of both physical and psychic readiness. Working with animals, and even three meters long sharks is far less dangerous than being underwater,” says Gajić. Fear is the first reaction to the importance of encountering one of the biggest marine predators, however, Andrej emphasizes that, if we look at statistics, sharks should be more afraid of us than we are. “These are magnificent encounters, which no pen, no picture, nor any video can come close to even a small percentage. 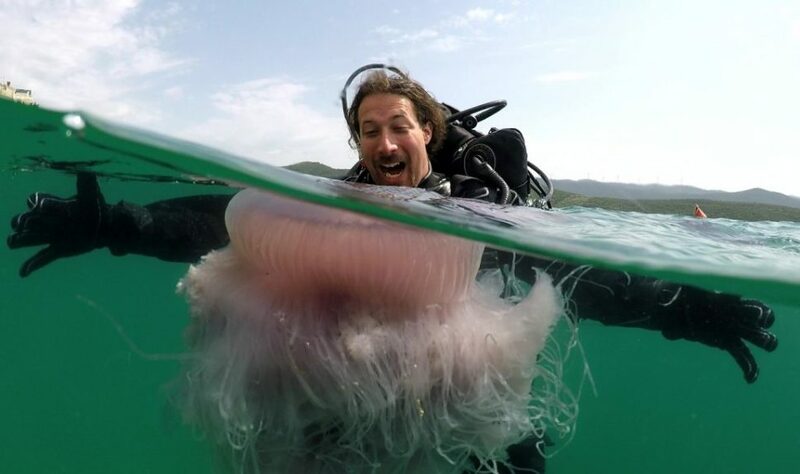 Close interaction with a very large sea animal, such as feeding, capturing for feathers, sampling, requires a very strong preparation of all researchers, primarily theoretical, and then practical. You need to read very well the body language to interpret everything that the animal wants to tell you – it’s worth remembering, we are always in their territory and often do not think at what time we came to our home. Of the 550 species of sharks, only 20 can really be dangerous to humans, most of them presented to very scary and small-scale fish. While sharks have killed several people annually, people have killed more than 150,000,000 individuals, bringing certain populations in this way to the very edge of survival, resulting in irreversible imbalances in aquatic environments, which feed millions more,” says young Bosnian scientist. Andrej has a message for those who want to, but they did not devote themselves to research and adventure. “As a diving specialist and an independent parachutist, I feel that staying in the water, as well as staying in the air, is something that changes your life and what you need to do at least once, and most preferably from 18 to 20 years old. If you do not dive, and you think that you have observed the enchanting beauty in this world. Still, dive,” Gajić concludes.